Discussion in 'Georgia Tech Basketball' started by Peacone36, Jan 28, 2019. One of the things Nick asked of me when covering the Georgia Tech v. Duke game on Saturday was a post game write-up. I wanted to do something interesting instead of the normal, hacky write-up, so I spent most of day yesterday thinking up a way to write something different and I came up with this. This was my first experience in Cameron Indoor Stadium. I moved to the triangle a few years ago with the thought that I would be attending games left and right. PNC is right up I-40, and Chapel Hill and Durham are about 50 miles from the house. What I didn't realize then and what I now know too well is, these people are really serious about their basketball and their ticket prices reflect that. I remember thinking I was "definitely going to Duke/UNC" a couple of years ago until I saw that tickets on Seat Geek were $4000. So when Nick approached me with the opportunity to represent the community at Cameron Indoor Stadium I immediately jumped at the chance. He made it a point to tell me multiple times to "not embarrass us." Because as you all know, I tend to get a little excited sometimes. Saturday morning starts out around 5am. I am an early riser anyway. The fact that I know I am going to be lost in this first time experience has me a bit "shook", so I am wide awake this morning. There is little to do at 5am, so I head upstairs and play a bit of Call of Duty to pass the time. Around 8am, I start to get ready and finally head out a little before 9. I get about three miles down the road and it hits me. I forgot the parking pass. Get back to the house, print the pass and head out again. Five red lights and 20 minutes later I am about to jump from Business 70 to I-40 and my low tire pressure sensor comes on. I don't have time for this. I turn around and burn another 20 minutes getting back to the house. I jump in the company truck and, for the third time, set out for Durham. I arrive on the Duke campus around 10:30 am. Naturally the first thing I do is go to the wrong place to pick up my press pass. The lady was nice enough and got me straightened out and had it five minutes later. It is 75 minutes before tip and the court yard is full of college students already, which is to be expected, but it is still different. Chapel Hill isn't like that. I get through security and am trying to play it cool, but I have absolutely zero idea where I am supposed to be. There is no seat, row, or information of any kind on the pass and it was the only thing in the envelope. I ask an usher where the media room is located and he points me to the opposite corner. I make my way through some cozy corridors and end up on media row. The Crazies are already there, in full force and they are standing IN media row. Not behind it, not close to it, the seats are pushed in and the Crazies are against the backs of the chairs. Unable to find the seat with GTSwarm on it, I ask another usher if he has any idea where I am supposed to be. He points to the media room. I go into the media room and immediately look like a Nebraska farm boy at a Boyz II Men reunion show. I don't know what to do with my hands. I'm sweating, I'm lost, these other guys are at their one millionth game, it's just work for them. I finally see a picture on the wall with a list showing where all the members of the media are sitting. I am not on it. At closer look I am on it, in "Auxiliary Press Seating" in section 4. That is over by where I started. I make my way back to section 4 and the young lady lets me in. I go into section 4, and just go the balcony and find seat 5. I am sitting right over where the GT locker room entrance is so I thought that was pretty awesome. I got to watch Coach Reveno work out the big guys which was impressive. I was also able to watch Rev throw one down after Evan Cole put one down then looked like he was kind of feeling himself, which I found pretty comical. Coach Rev and the big guys go to the locker room and I then watched Coach Schwartz work out the perimeter guys. They worked almost exclusively on close-outs and getting a hand up. The drill was 90% defense orientated. As the crowd begins to fill in an older couple comes down and sits in the two seats next to me, they are obviously not media members. I begin to once again get a little nervous and sure enough a lady and her husband come down and greet the couple next to me and move to get into their seats, and to their surprise, the lady finds me in her seat. Once again, I am in the wrong place. I go and find another usher and ask her where the Auxiliary Press is supposed to be sitting and she doesn't have any idea. It is at that exact moment I look up and see the white box at the top of the stairs that I had seen Jay Williams broadcasting out of in Duke's previous game that had some younger guys with laptops in it. That was a real "Duh" moment for me. Me: "Is that where I am supposed to be?" I make my way upstairs and find Seat 5 in the box with a sign in front of it "GT Swarm". Finally. There is a young man next to me from the Henderson Daily Dispatch who looks at me nervously. "How's is going?" he asks, I tell him it's going well now that I am in the correct location, to which he replies: "Yeah this is my first time in Cameron." I immediately feel like I am with my people. By this time, Cameron is hopping. All the students are there and they are hostile. The next 30 minutes is rather uneventful until the tip. The Jackets come out and looked pretty overwhelmed early. Curt missed a couple of triples and then passed on another wide open look. He was obviously inside his own head. Banks was tagged for his first foul 59 seconds into the game and hit with another around the 17 minute mark. AD was the probably the only guy on the court that looked comfortable. As Duke continued to miss threes and Tech continued to hang around I felt great. My presence obviously being the differentiating factor between today's game and the previous 14 years of losing in this building. Curt hits a triple before the half and the good guys are up by a deuce heading into the locker room. All is correct in the world of Cone. The second half starts off great, we push the lead to 38-31 and then it happens. Turnovers. Not just turnovers, live ball turnovers. Break-out inducing turnovers. Zion dunk. Zion goal interference that is inexplicably not called and he gets the "And-1" call. It was around this time that I let out my first "Oh give me a break," which was met with a chuckle from the guy next to me. *Inner Monologue*: Nick said don't embarrass us. Skip ahead to near the end of the game. Teddy Valentine has realized he is reffing in Cameron instead of calling it fair, so after he taunts Pastner I decide it's time to head to the media room and get settled for the press conference. I make my way to the concourse and hit a stairwell that dumps out into the court. I go back upstairs, hit another one and run into security who tells me: "Sir you can't be down here." I end up walking around all over CIS, twice looking to get back down to the media room. When I finally arrive it is minutes before Coach Pastner walks in. He gives his spiel, praising Tre Jones's ball hawking ability and Zion's superior athleticism. "We blocked out and he just out jumped our guys." He comments on James Banks' foul trouble and how he and AD needed to play better. The thing that took me by surprise was when I looked at the final box score and saw that Zion had 22 and 7. I didn't follow the stats in-game, but I didn't think there was any way that was accurate. I thought GT did an exceptional job denying him and preventing him from getting the momentum shifting play until around middle of the second half. I listened to coach use the word "survivability" about six times in seven minutes and then he was done. Also, Marvin Lewis is a much larger man than I anticipated. All in all, with the exception of a few embarrassing moments for me personally it was a great day, Thanks to GTSwarm for making it happen. Hope you all get some laughs at my expense. Bogey404, plangineer, dtm1997 and 16 others like this. Awesome info, thanks for sharing. Very well done, but I'm not sure that you should have referred to Cuse's postgame reports as, "normal, hacky write-up." Peacone36 and CuseJacket like this. It really is a bucket list destination. I've been to one game there, a couple of years ago when they dropped about 150 on us. My seat was 2 rows behind the GT bench, and we accessed our seats by walking on the floor, in front of our coaches and then up to our seats. It felt like I was at a high school game, but it was Cameron. I felt like a little kid that had gotten away with something. Absolutely the worst basketball arena in the ACC but the best college game experience anywhere. They used to throw things on the floor during introductions. They threw empty pizza boxes out of the stands when Dennis Scott was introduced. They stopped that stuff several years ago. @Peacone36 sorry I meant to add thanks for the writeup. I got caught up in my own memories. You saw a much better game than I did. Thanks for the write up. 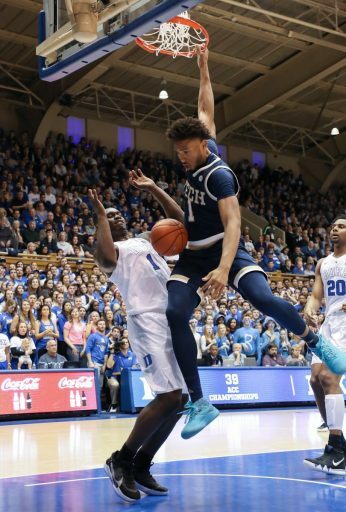 FWIW I think we were doing a good job on Zion for most the game. 8 of his points came while both Banks and AD had 4 fouls and he took full advantage. Enjoyable write up and glad you had a memorable experience. Fun game, wish the result was different but the Jackets had the adrenaline pumping and me jumping off my couch for much longer than I had anticipated. @Peacone36 I just wanna know if you kicked any of the dookies in the shins while you were there? If not, I'll be thoroughly disappointed. Nice write-up! I've been to games in Cameron three times - one was a GT game (in the Travis Best vs. Bobby Hurley days.. where we won the first half and last 15 minutes ... but the first 5 of the second half had Cremins calling time outs!). Definitely a unique place - and on short list of best places in country to watch a game! The other two I went to there were vs. FSU (Duke won easily) and Wake - where Tim Duncan and company won on shot in the last minute followed by Grant Hill missing wide open shot at the buzzer. Glad you got the chance to go ... and we're all glad the game was at least somewhat competitive. Nice write-up, good read, Thanks ! I was there once, which must have been 1987 because it looks like that was the only year Tech won in Cameron in that time frame. The most memorable moment came at the end of the game when an older gentleman in front of us (probably younger than I am now LOL) stood up and yelled at the court "Go to Hell Georgia Tech", then turned around and told me "and you can go to Hell too." I think he made an offer to take it outside, to which I responded that it was college basketball and he needed to get his priorities straight. His wife looked pretty embarassed. I honestly thought I was very restrained in my cheering, which I really tried to be in opponent arenas. Anyway, that's a trip down memory lane. Nice write-up Peac, and glad you got to go. Good job.I've never been there but your write-up helps a lot. First, an excellent and entertaining (and very human) write up. my compliments. i enjoyed reading it. I was in Cameron only once, and it was empty (no basketball game). My recollections were being impressed by the hardware and handrails. They seemed to be some sort of quality metal, not industrial looking at all. This was some years ago, but I remember being very impressed back then by it. It also struck me as being smaller than I thought it was. (But I was in the Dean dome on that same trip, so it may have been a 'by comparison' thing. Small but exceptional was how I felt about it as a venue. The other dynamic is the way the students are right by the court. As much as I think the crazies mantra is overblown, it does create a ton of noise and set the tone for the rest of the building. UNC's students are in multiple spots throughout the building and don't have the concentrated effects.